Leading off today: Thursday may have marked the opening of the high school football season, but the most important punt of the year for many high school sports fans came Tuesday when an enormously popular lacrosse website shut down. "After more than 20 years of service to the lacrosse community, we are sorry to say LaxPower is hanging up its pads and stowing its stick on Aug 28, 2018. Nothing great can last forever, and we'd like to thank the entire community for its support." LaxPower.com was launched in 1997 by Larry Feldman, whose computer rankings system became uncannily accurate throughout the years. The site had a small staff, including Central New York resident George Hollenbeck. Over the years, the site added extensive news coverage, game schedules, historical information and recruiting databases. Football openers: Victor confirmed its going to be a force to be reckoned with in Class A of the NYSPHSAA, beating Pittsford 16-0 before a large crowd at St. John Fisher College. Kordell Jackson scored on a 79-yard reception from Hudson Alread on the first play from scrimmage and made an interception on defense for the Blue Devils. Sophomore running back Rushawn Baker took a carry 90 yards for the Blue Devils' second TD. • Senior running back Steven Barrett ran for two TDs, including a go-ahead score in the fourth quarter, to spark Oneida past New Hartford 26-20 at the Carrier Dome. • Ogdensburg converted two first quarter turnovers into TDs and rolled past Sauquoit Valley 55-0. The Blue Devils scored all eight of their touchdowns on the ground, including scampers of 14 and 53 yards by quarterback Michael Reed in the first half. Texas futility ends: Fort Worth Diamond Hill-Jarvis won for the first time in nearly eight full football seasons, snapping a 77-game losing streak with a 40-12 victory over Conrad High. Diamond Hill-Jarvis had been encroaching upon the state record of 80 straight losses by Houston Jefferson Davis from 1985-93. NIMBY: The Buffalo News had an interesting story this week about how some neighbors of the high school/middle school campus in the Tonawanda City School District are tired of the noise, lights and traffic from the relatively limited schedule of night contests. The expanded facility has been in operation since 2013 and triggered a lawsuit in 2014. The district has lost two bids seeking dismissal, and the case is expected to go to court in February. "At this point, they've given us six summers to see how bad it is," one resident told the paper. "Now we know loss of value of property." At a minimum, some residents had wanted the school district to install privacy fences adjacent to their yards to cut down on the inconvenience. Instead, a chain-link fence was installed in 2014. More reading: If you successfully avoided high school sports news all summer long, I'll catch you up on the key developments in my first column of the school year on PressConnects.com. Looking ahead: Schuylerville at Glens Falls on Saturday shapes up as one of the more intriguing Week 1 football matchups. Glens Falls was the NYSPHSAA Class B champion in 2016 and a state semifinalist with an 11-1 record a year ago. The Indians return three all-state players -- Class B co-player of the year Joe Girard III (QB), Kyle Vachon (LB, 2nd team), and Sam Hogan (PK, 3rd team). Schuylerville, the 2015 state Class B runner-up, finished last year 8-2 -- with the setbacks coming against Glens Falls by scores of 27-14 and then 40-37 in the Section 2 title game. 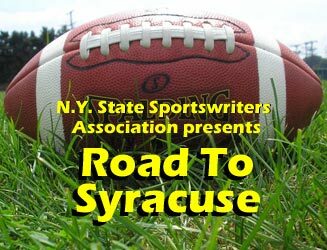 Schuylerville returns three all-state players -- Stratton Sherman (DB, 4th team), Jared Thivierge (DL, 5th team) and Paul Harshbarger (all-purpose, honorable mention). Regardless of Saturday's outcome, there's a good chance of a rematch in the Section 2 tournament. Extra points: The Arizona Interscholastic Association stripped Tucson's Sabino High of its 2018 state baseball championship over violations of AIA rules, including recruiting violations, issues with coaching qualifications and misuse of funds. Coach Mark Chandler resigned his position on Friday, and Sabino administrators will appeal at the AIA's Sept. 12 meeting.